When you’re looking through power washer reviews, you want to make sure that the ones that you find are going to be helpful, and the only way to do that is to make sure that you know what you’re looking for. For example, take electric pressure washers. The best electric pressure washer for you is obviously the one that meets your needs. But… you need to be able to first identify those needs and make sure that your machine will best address them. That may mean not getting an electric power washer at all, but going for gas instead. You’re Buying… a Power Washer? Should You Go Electric or Gas? Once you’ve defined your needs and have started looking through power washer reviews, pay attention to common things that are helpful to know about any power washer. Some problems are universal and should be avoided, or at least you should be aware of them. You want your fittings to be brass if at all possible. The fittings are the pieces of the unit that connect the water source to the input and the wand to the output. A lot of power washer companies try to save money by making these particular pieces out of plastic instead of a higher quality material. But the problem is that with incredible amounts of water rushing past them for hours on end, usually under thousands of PSI, it’s unreasonable to expect that they’re going to last very long. Many units will allow you to replace the fittings, and if you find yourself with plastic ones, spend a few extra dollars to replace them immediately. If a machine comes with brass, consider it a point in its favor. One of the big things that you should pay attention for when it comes to buying a power washer is where the center of gravity is on it. Not all power washer reviews will mention it in those terms. But most will talk about how steady the main unit is, or how often it tips over, or how much of a chance it has of falling out of its frame. What you must keep in mind is that you will be several feet away manipulating a hose attached to the main unit. It is very easy to knock something like that down just by turning the corner too close. Something with a low center of gravity that is unlikely to tip over is going to be a lot better for you. No matter what sort of power washer you get, it will make a certain amount of noise. However, if you’re going to use it for hours on end, you want that noise to be as little as possible, or you might end up damaging your ears over time. You also want to pay attention to how much the main unit shakes when it’s in use. A common theme among reviews is to talk about extra nozzles. These are often housed in special compartments in the main unit and can be shaken out of their housing and damaged by a machine that vibrates too much. In the case of some gas washers that come in metal frames to keep their engines off of the ground, too much vibration can actually shake the frame apart by loosening the screws. This could lead to problems. No matter what pressure you need or what job you’re trying to do, it’s a good idea to have plenty of hose to do it with. Some machines come with only about twenty five feet of hose. This sounds like a lot until you start having to drag your washer around the house or up on the roof. Similarly, you don’t want to have a hose that is too stiff or dries out too quickly. In all of these cases, you’ll end up with leaks in the hose. This will lower the pressure you get and make your machine useless. The best electric power washer is one where the hose stays in good shape, doesn’t have a lot of kinks, and is long enough that you can clean significant areas without having to worry about dragging the main unit around too much. None of these should be treated as a deal breaker. But if you can avoid them, do so. Each can cause problems for you until you either find a work around or get a new power washer. There are a lot of things that a power washer can be used for. Most often, they are seen as high pressure cleaners for concrete structures like sidewalks and house walls. But with so many different powers and options available, there are a number of different uses to which you can put a modern power washer. Car Washing – This can only be done with lower powered electric washers. It is not recommended that you try this with a gas washer unless you know that you have extreme control over the pressure. Gas washers are strong enough to strip paint from chrome. 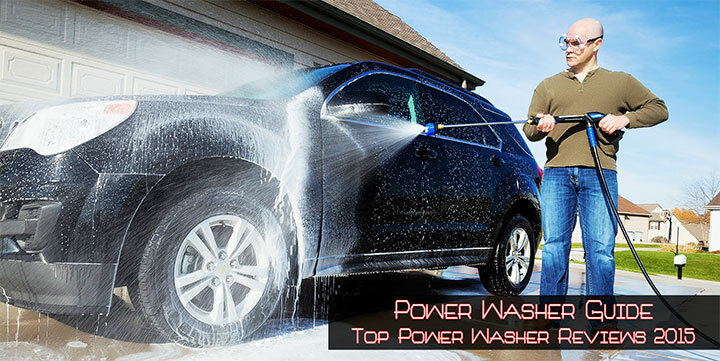 That being said, the best electric power washer could be the one that you use every week to help you give your car a really deep clean. Many of them have detergent reservoirs that can make soaping and washing very easy, cutting the time and effort involved in what is normally a chore by quite a bit. Pest Control – Wasp and bee hives can be a major problem and put you and your family in danger, especially if there are possible allergic reactions involved. But getting too close to them could put you right in the middle of the fury once you actually knock down the hive or nest. That is, if you can even get close enough to reach it when you do. Instead, it’s much easier to stand way back and use your pressure washer to clear the offending insects out of the way from safety. Patio Furniture – You don’t have to use your pressure washer only on the patio itself. If you have plastic, stone, or even metal patio furniture, you can be sure to give it a deep and thorough clean with your power washer. It’s really as easy as taking away any cushions that might get soaked and hitting every piece with a few blasts from the wand. It can also be used to clean dirt and debris after a major storm. Let me back up a bit. Before you being trolling reviews, begin by identifying your project or projects. There are a number of uses for this type of machine, and the best electric power washer for you is going to be the one that addresses most of them, if not all of them. Do you have stains on your home that you want to get rid of? Are they deeply set in, or are they reasonably new? What are they made of? What sort of material is your home made of and do you have to worry about things like paint? What if the stains are on your driveway instead? What if it isn’t a stain, but simply… dinginess, and is actually on your deck? Or on your patio furniture? Or your car? These are just some of the questions you should ask yourself in the quest for the best electric power washer. Not all power washer reviews will take on all of these questions, or even all of the questions you may have, but it’s absolutely vital that you start from the basis of knowing what you’re looking for. Another thing to consider is that sometimes you may want to make your investment for only occasional use. Power washers tend to have limited utility and are only really useful every few months, at least the very powerful ones are. Less powerful ones may not be able to accomplish certain tasks, but they are more useful at doing a wider variety of things. For example, do you have a problem with wasp nests around your home? If so, the best electric pressure washer for you is the one that is going to be able to safely remove those from a distance where you’ll be safe. A more powerful machine might blow your gutters off the side of your house while a less powerful one would just make cleaning them a snap. Trying to find the right balance between power and utility can be difficult, but again the trick is to start with what you plan to actually use the unit for. Once you have an idea of what sorts of uses you’re going to put your power washer to, you can then start looking at power washer reviews for appropriate features. As I mentioned above, the best electric power washer for you might not be electric at all. If there are broad categories that pressure washers tend to fall into, perhaps the most obvious would be “electric” and “gas.” The biggest difference is, of course, the way that they are powered. The former is plugged in and the latter is filled with the same type of gas that you put in your car (or lawn mower). However, there are a lot more differences that aren’t nearly as obvious. For example, gas pressure washers tend to be a lot more powerful than electric ones. Usually, the pressure in a washer is measured in pounds per square inch (PSI) based on its maximum possible rating. 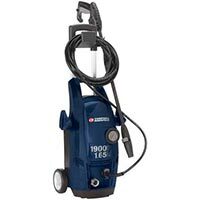 Most electric power washers tend to run in the 1,000 – 2,000 PSI range, with the latter being a very outside possibility. Sometimes they may even get up into the 2,300 range, but that’s really pushing it for an electric. Gas washers on the other hand tend to start closer to 2,500 – 2,700 PSI and can reach pressures into the 4,000 PSI range. They are the powerhouses of the pressure washing world, and while they may be good for deep cleaning things that are unlikely to break or be hurt easily like steel I-beams, they are wretched at things like cars or painted houses, since that amount of pressure can peel the paint off of them very easily. Another difference between them is portability. While not every electric power washer is easy to move, even the heaviest and most cumbersome of them is going to be a breeze compared to the average gas model. Gas washers can weigh over a hundred pounds or more when full and ready to go. Many electric models, on the other hand, can literally be held and carried the same way you carry a leaf blower or a brief case. They can be very tiny and light, though with so much highly pressured water running through it you may end up with cracks that limit its effectiveness. The ability to break (fragility) is another way in which electric and gas pressure washers differ. The best electric pressure washer is one that will be with you for a while, at least long enough to justify the purchase. But the problem is that most of them tend to be made of plastic, or primarily so. Plastic can’t always take the strain of containing highly pressured water. A cheap one can burst apart at the seams. Gas pressure washers tend to be made of sturdier stuff and have a lot more metal parts. That being said, the added complexity may make them even more prone to breaking. For example, if an electric unit doesn’t start, there are a number of intuitive troubleshooting steps that can be taken in order to fix the problem. With a gas unit, it could be any number of pieces. You may have to take the entire thing apart to get at the cause. Winterization for gas pressure washers is a lot more difficult and complex as well. Winterization requires the entire system be filled with anti-freeze in most cases and the spark plugs be appropriately taken care of, among other things. The best electric pressure washer you’ll find is one that doesn’t require more than storing it well to make sure you can use it in the next year. Simpson is the leader residential gas washers. Another reputable name is Generac. Price is a major factor and one you ought to consider very closely in your search. The thing is, it’s difficult to pin down what sort of price is a good one, since there is a huge range of possible costs for different types of washers and no real way of saying what they mean or not. There are, however, a few general trends. First of all, the more pounds per square inch that you have, the more expensive the machine is going to be. PSI is the primary measure for quality in a power washer, so the more of it you have, the more that is going to cost. That being said, it doesn’t always hold true in the upper ranges of electrics where they overlap with the lower ranges of gas powered ones. That’s because of the next rule of thumb. Gas powered pressure washers tend to be more expensive than electric ones. That’s generally because gas washers use more expensive materials in their construction and employ much more complex engines. This increases the price. 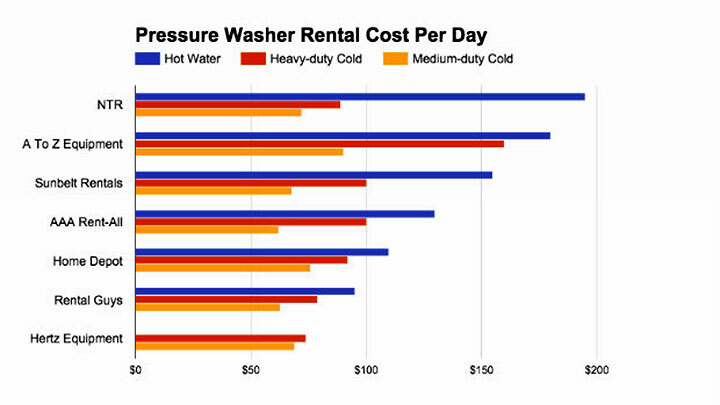 There are times when a 2300 PSI gas powered washer will be more expensive than a 2500 psi electric one just from the materials and engine cost. One thing that you shouldn’t assume is that higher cost means more dependable. If anything, the more expensive models tend to require a lot more maintenance in order to keep them in working shape. There are very expensive washers that won’t last past a couple of days of intensive use, and very cheap ones that you’ll have for life. So don’t assume that the more expensive unit will necessarily last you longer. Hopefully I’ve alerted you to some of the things that you need to pay attention to when buying a power washer. There’s even more available to you so long as you know what you’re looking for. 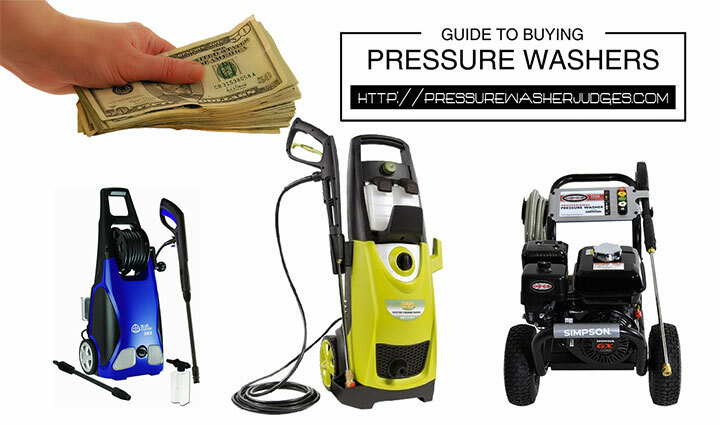 Once you understand that, you should have no problem finding the best electric pressure washer for you.